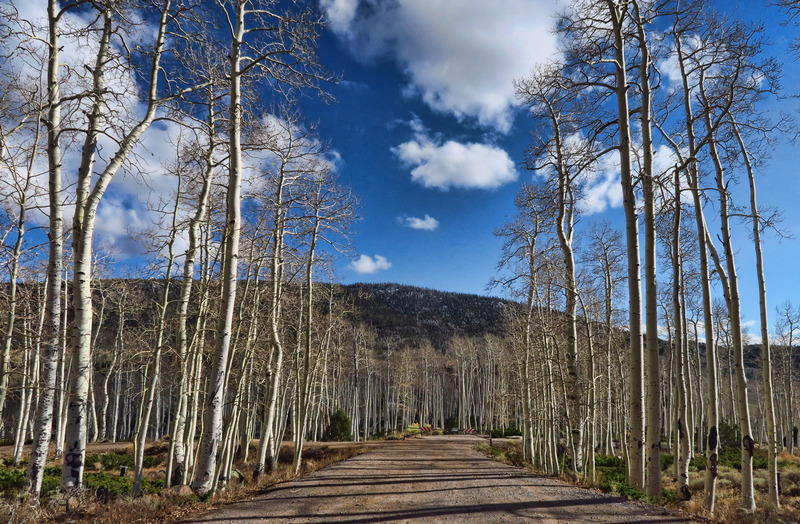 Pando, the Latin name for “I spread” is a 106 acre aspen grove in Fishlake National Forest. The estimated 47,000 trees in the stand all share the same DNA coming from the same root system believed to be 80,000 years old. 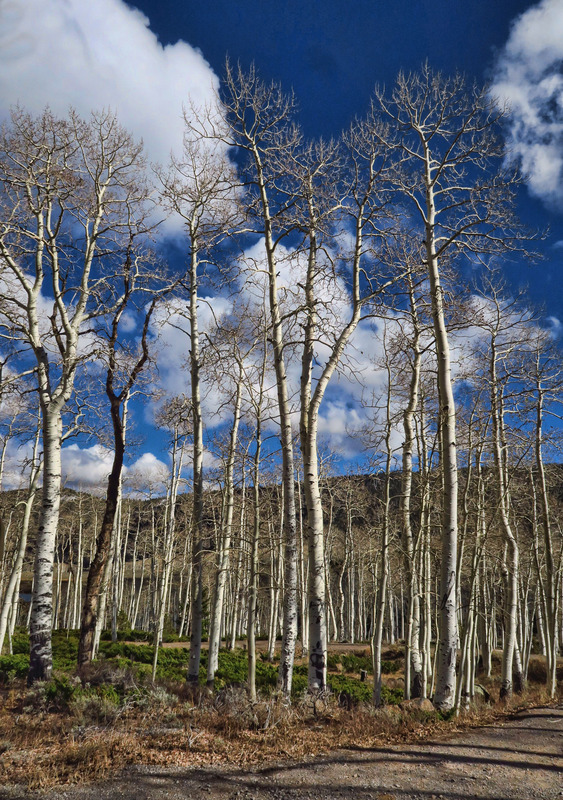 The fact that the trees have produced identical DNA results proves that they are not only the largest known aspen clone, but Pando competes with the fungal mats in Malheur National Forest in Oregon for the title of the largest/heaviest living organism on the planet. Fascinating to know these are all an offshoot from the same root system. 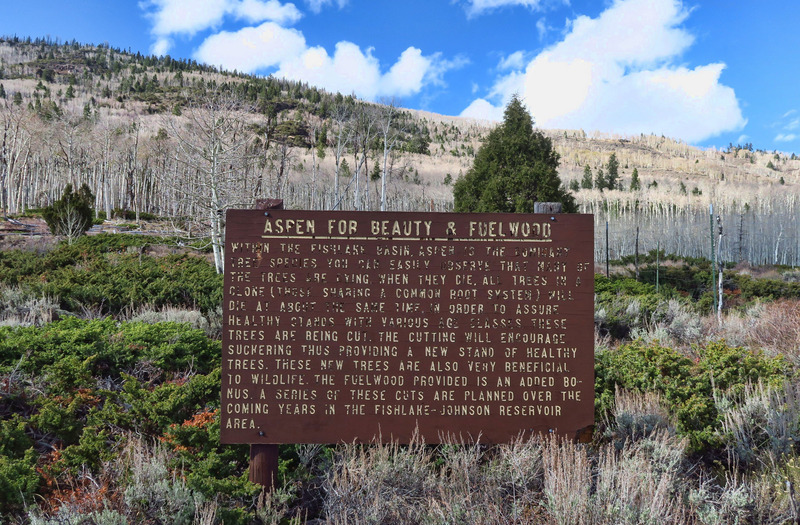 Aspens are unique in that they are “clonal,” reproducing not from seeds but rather from suckering. Each of the trees in the grove is genetically identical and all the trees share a single root system, reproducing asexually by sprouting new trees from the lateral root of the parent system. 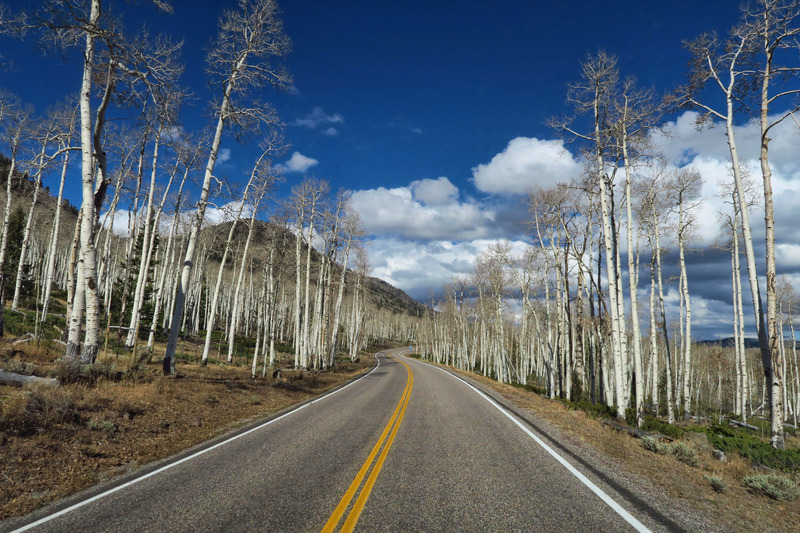 However, Pando is shrinking, even believed to be dying. 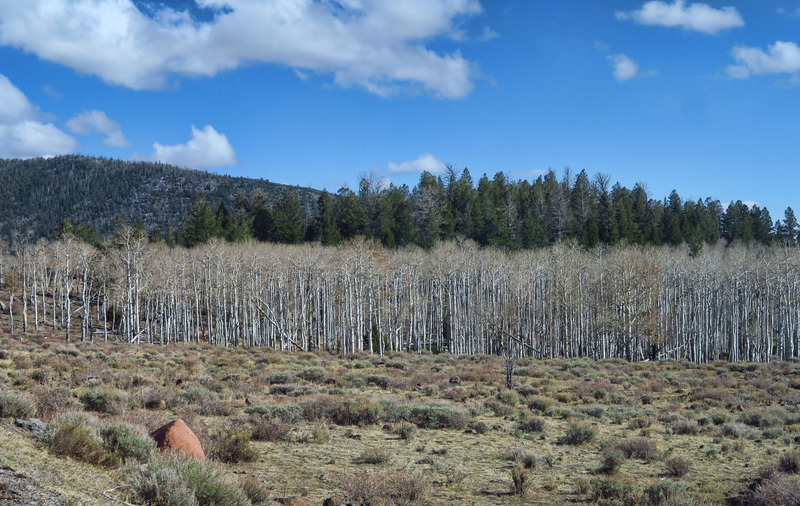 The increase of grazing animals like cattle and mule deer in the area, along with encroaching humans are posing a threat. 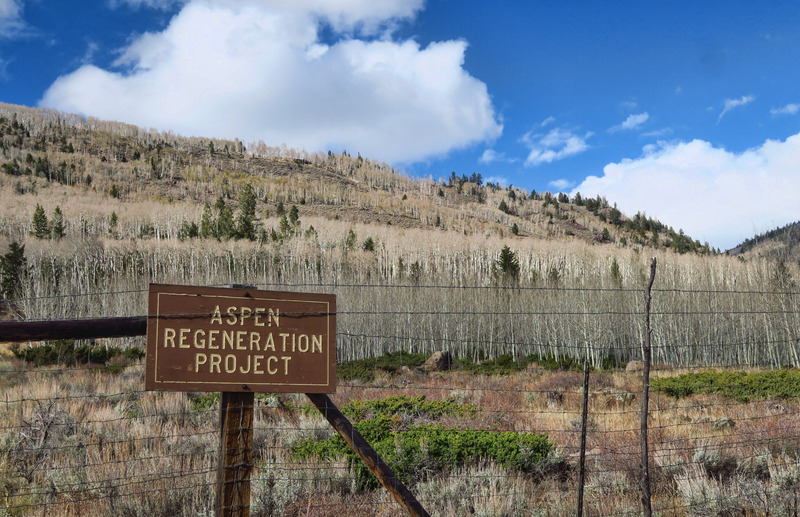 The animals feed off the new aspen shoots faster than the organism can produce young offspring to replace the dying trees, leaving behind what equates to an old folks home. Some trees in the stand are believed to be 130 years old. The clouds are competing with the trees in Mother Nature’s show today. There are restoration projects underway in the area. Of the 106 acres, they have fenced off 90 of those acres to protect the new growth. Researchers believe it will take a combination of the fenced areas to protect shoots of the clone, as well as culling deer and restricting free range cattle grazing to save the massive clone. Meanwhile, studies as a result are expected to benefit other species worldwide. A little snow left over in the hills from the weather system that chased me down from Wyoming. Although the golden leaves of the aspens have long fallen by the time I arrive, now reduced to a soft, musty blanket of muted browns on the forest floor, I am still enchanted by this place. Entering on one side and exiting the other, knowing this massive grove is one of the largest living organisms in the world makes me imagine I can sense the life of the organism while standing in the middle of it. The sound effects add to this, as what few leaves left on the near-naked branches are “quaking” all around me in the brisk breeze. 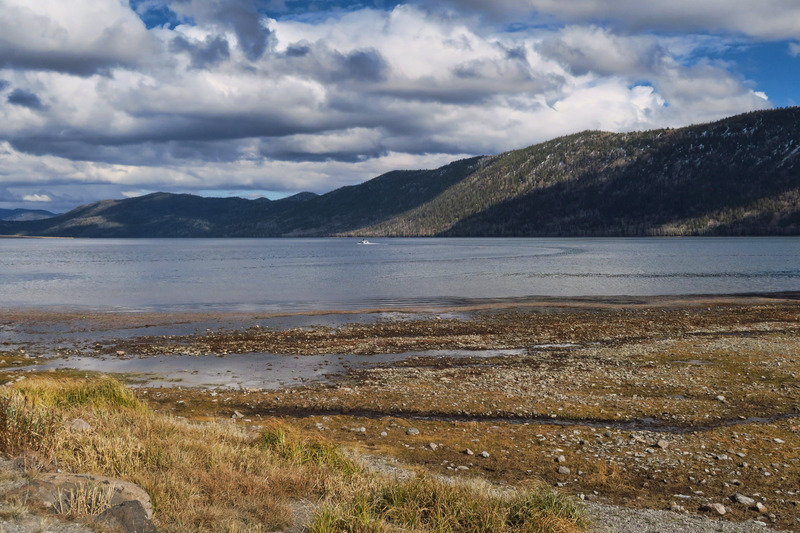 After driving through the aspen forest, I arrive at Fish Lake Marina. 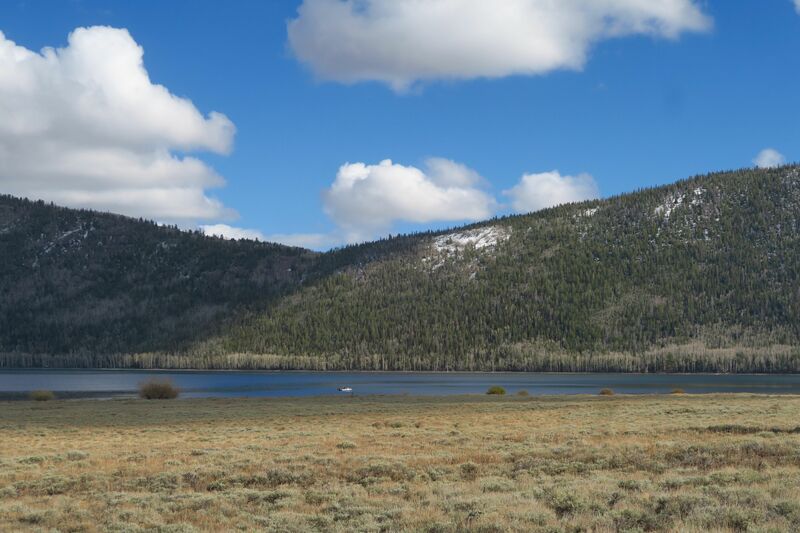 Although only six miles long and one mile wide, Fish Lake is the largest natural lake in Utah. It’s a crisp cold day on the lake, and there’s residual snow in the shade of the trees on the surrounding hills. No one’s around except for one young man wearing some sort of forest green uniform. 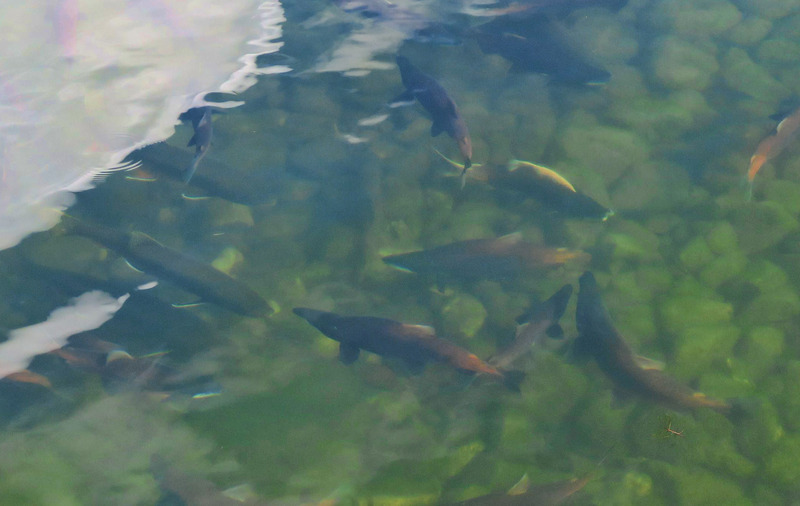 He walks with me around the edge of the marina, pointing out the masses of jewel-red Kokanee salmon schooling below. He explains that although the salmon are certainly a worthwhile catch earlier in the year when they are not spawning, their real purpose in being stocked in the lake is for a food source for the Lake and Brown Trout who like to feed on the juvenile salmon. One lone boat on Fish Lake today. 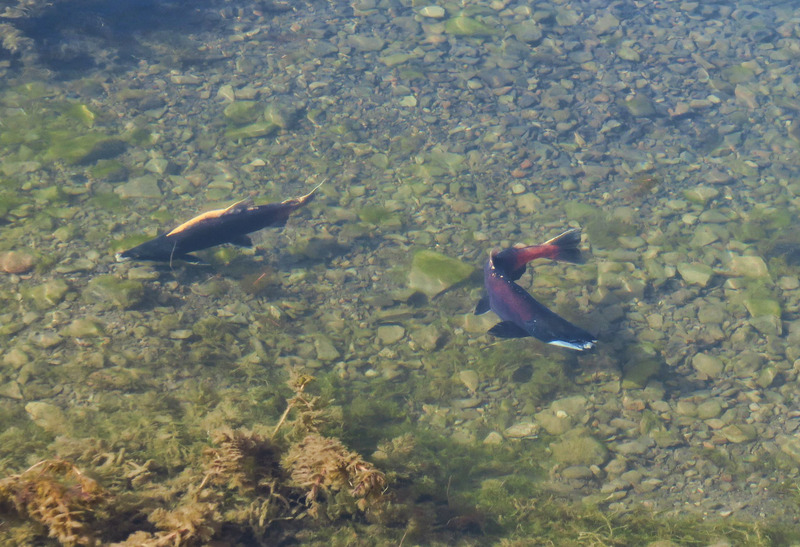 Lots of brilliant red Kokanee salmon spawning below. Can you see them beneath the glare on the surface? Kokanee salmon are just Pacific Sockeye salmon that are landlocked. He also tells me that it’s a very short fall color season at Fish Lake, with the “gold rush” only lasting about three weeks. He describes the intensity of the color change with a sense of urgency, encouraging me to come in late August as it happens earlier at this elevation. I try to imagine how brilliant these hills must be with all 47,000 trees glowing the low-lying autumn sun. 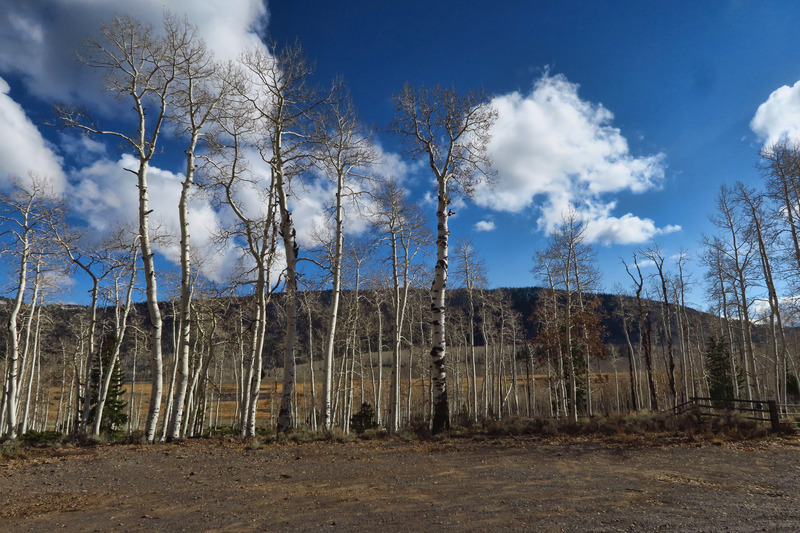 Not only was the Pando worth the 18 miles I went out of the way to see it, but I would return here again one day to explore further. There’s boondocking nearby, and I notice a few trails. At 9,000 ft, I think it would be a great place to escape the summer heat. But on the other hand, knowing the fragility of the “old man in the forest” and his struggles to reproduce his future generations, I feel like I should retreat quietly back to the highway and continue on my way, leaving Mother Nature to do her thing. 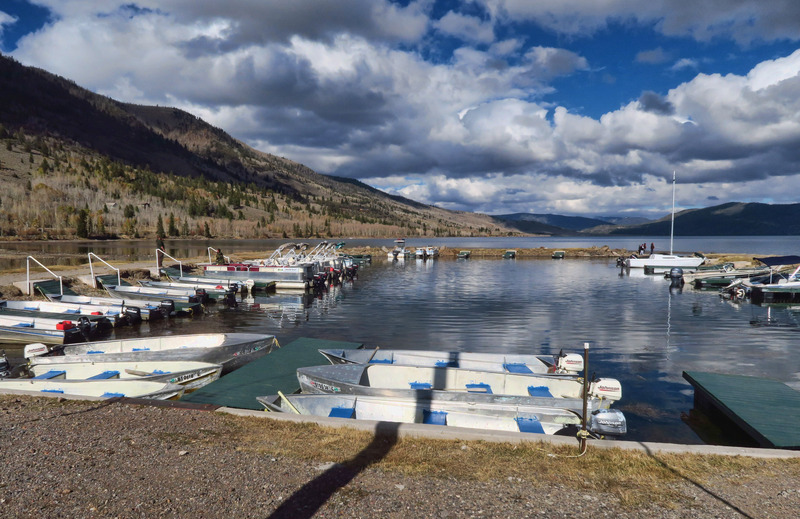 This entry was posted in Utah and tagged Fish Lake by Suzanne. Bookmark the permalink. 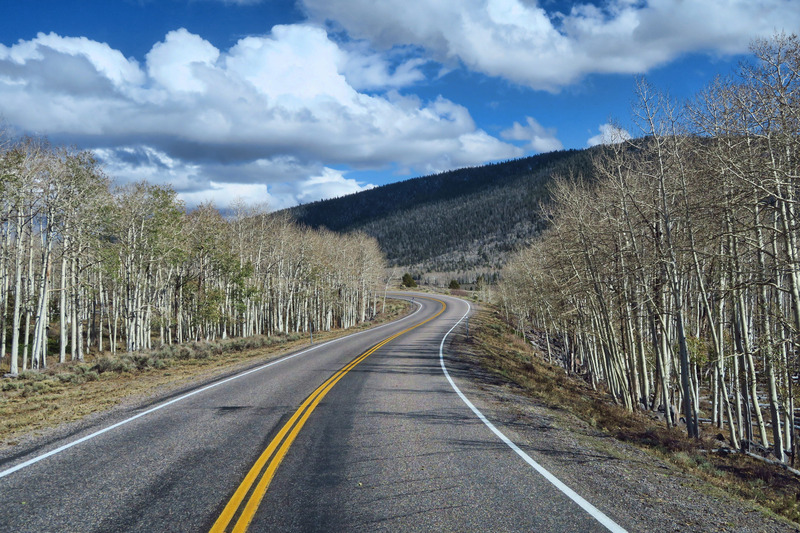 You make August at 9000 feet sound very tempting. Maybe I will have learned how to use my new camera by then. When did they get so complicated? I had heard about the Pando, but did not realize the size of it. Thank you for the tour! 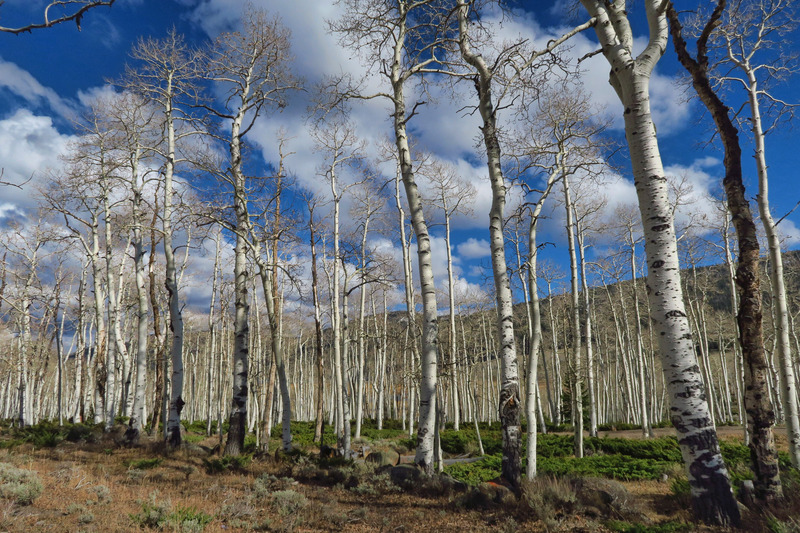 We’ve hiked through the Keebler Pass aspen grove in CO. Trees there are in decline, too, thought to be caused by drought and climate change. Sad to see. So sad. 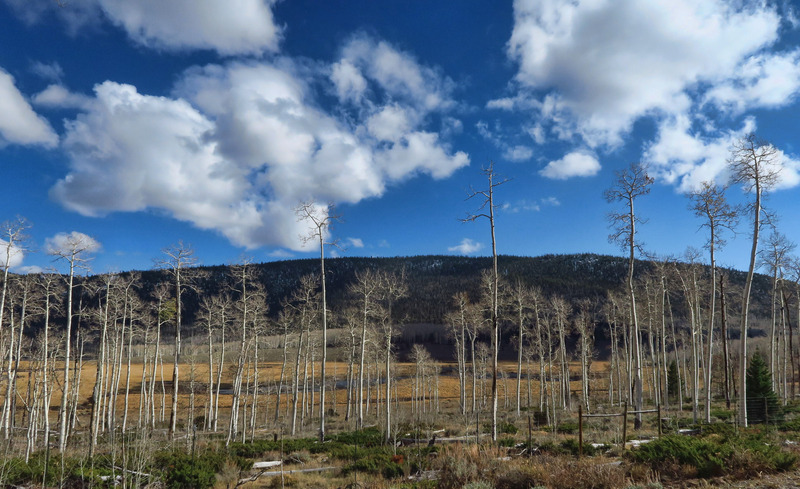 What an amazing thing these Aspens. The footprint of man is everywhere and mostly detrimental. We have to manage things because we don’t seem to be able to stay out of Nature’s business and let her take care of it. I know exactly how you feel wanting to be close to the trees but not wanting to be part of the problem. Thanks for sharing this.